Looking for some new spooky ideas this Halloween season? 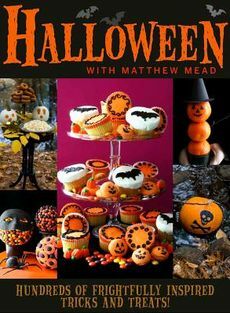 Halloween with Matthew Mead has over 140 pages of wonderful treats, tricks and craft ideas for ghouls of all ages. Learn how to make Purple Shaggy Cake, Cousin Harry Cupcakes, Alien Eyeball Cookies, and many more delicious treats surch to delight the eyes as well as the tastebuds. Craft and decorating ideas include Ghost Portraits, Painted Eggs, White Magic Party and new ideas for pumpkin carving and painting. Fifteen themes are covered, detailing dozens of projects with easy to follow instructions. Filled with gorgeous color photos and supported by a website with templates, recipes and downloads, this book is a great addition to any library collection, but especially a library who serves teens and likes to provide a spooktacular Halloween experience. Recommended Ages: 12+ Since some of the crafts and baking are complicated.